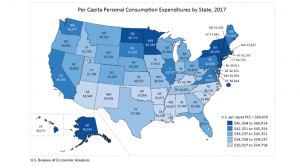 The U.S. Bureau of Economic Analysis indicated that, “State personal consumption expenditures (PCE) increased on average 4.3 percent in 2017, an acceleration from the 3.8 percent increase in 2016.” In addition, the PCE percentage change across all states ranged from 6.9 percent in Idaho to 2 percent in North Dakota. Expenditure growth in health care, housing and utilities were the main contributors to national PCE growth in 2017, which grew by 4.6 percent and 4 percent respectively. Furthermore, spending on health care and on housing and utilities were among the leading contributors to PCE growth in most states. In 2017, there was an averaged increase in gasoline and other energy goods expenditure by 11.7 percent. This was the first year-over-year increase since 2012. In every state, an increase was recorded for spending on gasoline and other energy goods. Whereas, Washington and Idaho experienced larger than average increases by 16 percent and 14.9 percent, respectively. After Massachusetts, the states with the highest per capita PCE were Connecticut, New Hampshire and New Jersey. On the other hand, after Mississippi, the states with the lowest per capita PCE were Alabama, Arkansas and Oklahoma. 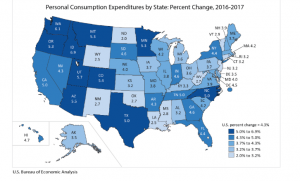 Additionally, “Mississippi, Arkansas, Alabama, and Oklahoma were among the states with the lowest per capita spending on housing and utilities and food and beverages purchased for off-premises consumption,” as mentioned by the BEA.